Click here to go to Issi Dye website. This entry was posted in Concerts & Events and tagged Aussie Rock, Johnny O'Keefe, Marlborough Motel, Rock n Roll on May 20, 2013 by allan. Currently residing in Barcelona, Australian classical guitarist Jacob Cordover enjoys a truly international career. His “consummate artistry” (Adelaide Advertiser, Australia) has enticed audiences in over a dozen countries across four continents. Following the success of the Australian Guitar Duo’s National Tour last year, Jacob will return to Australia again this May, this time for his first solo tour in three years. 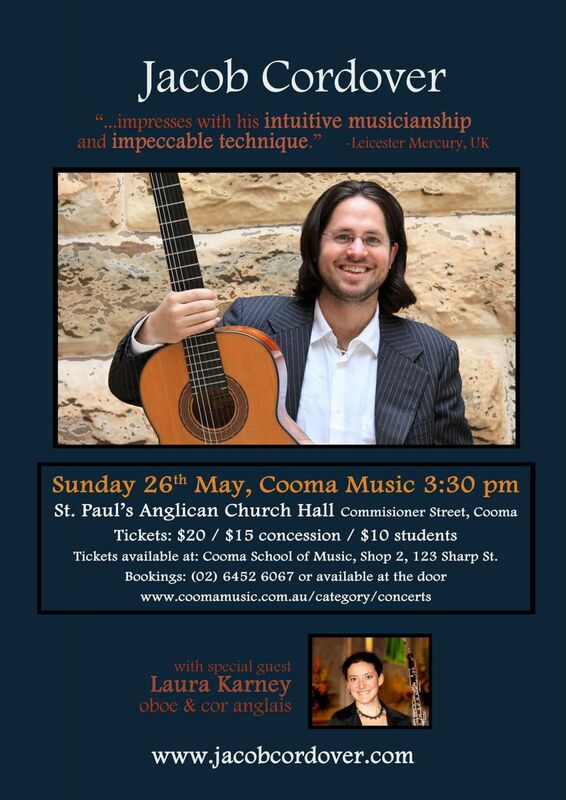 Jacob will perform a range of music that reflects his varied musical and personal background and his concerts will include Australian compositions alongside Spanish masterpieces as well as standard works from the classical guitar repertoire. 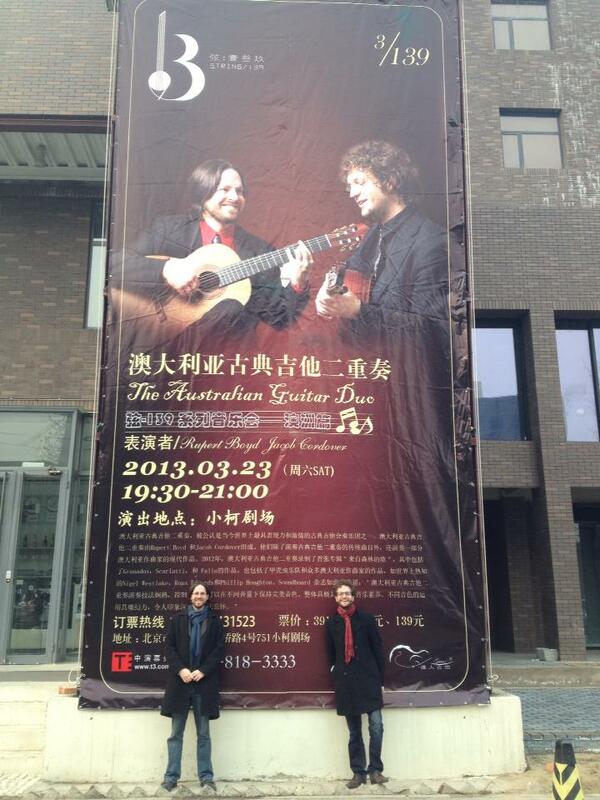 Since completing his undergraduate studies with renowned performer and pedagogue Timothy Kain at the ANU School of Music, Jacob has undertaken post graduate studies in Spain and France, has won numerous prizes in international competitions including a first prize at the Concurso Internacional de Guitarra de Córdoba, Spain, and has made TV and radio appearances in Australia, Canada and the USA. During his May tour, audiences can expect to hear works for solo guitar by Isaac Albeniz, Gaspar Sanz, Ross Edwards, Leo Brouwer, Lennon/McCartney and more. 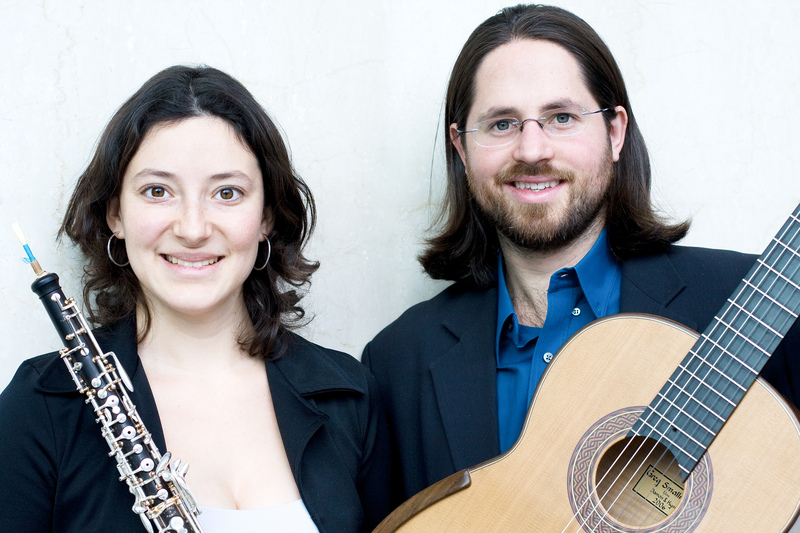 In what will be Jacob’s only Australian performances for 2013, Jacob will be joined by special guest Laura Karney (oboe & cor anglais). Together they will perform music for guitar and oboe and guitar and cor anglais including the beloved Siete Canciones Populares Españolas (7 Popular Spanish Songs) by Manuel de Falla. Starting the first week of May 2013, Jacob will give a total of twelve recitals in Melbourne, Canberra, Adelaide and throughout NSW. This entry was posted in Concerts & Events and tagged classical guitar, Jacob Cordover, Laura Karney, Oboe on May 14, 2013 by allan. 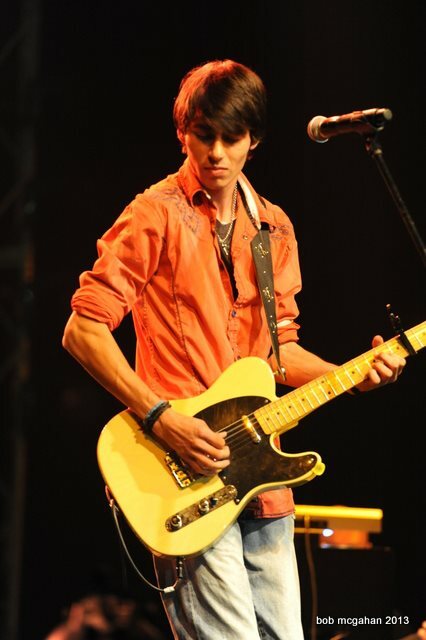 Cameron Cusack is a 21 year old Country Musician & Songwriter from South East NSW. Cameron first picked up the guitar at the age of 4 and has been a performing musician since the age of 9 with a dream of becoming a Country Music star. Cameron is a Vocalist, neurologist Guitarist; He plays the harmonica, malady Mandolin and Banjo. 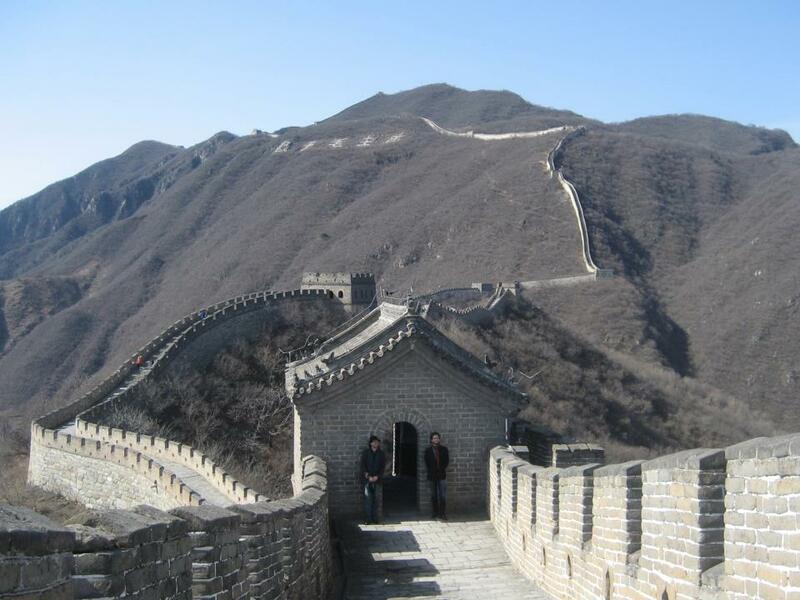 Cameron is a touring artist performing right across the country. Cameron grew up listening to both Australian and American Country Music such as Troy Cassar-Daley, Alan Jackson and Merle Haggard. At a young age Cameron Cusack has had numerous achievements. Being a 2011 Toyota Star Maker Finalist and performing with his greatest influence Troy Cassar-Daley atthe 2010 and 2012 Tamworth Country Music Festival at his sell out show at the Tamworth Regional Entertainment Center, Outback Jacks Bar & grill and South Tamworth Bowling Club. Cameron is also a 2009 Tamworth Camerata school of Country Music Graduate and a Graduate of the Senior College of the 2010 CMAA Academy of Country Music. Tamworth is a second home town to Cameron where he has had his first big breaks in Country Music such as performing at both 2009 & 2010 KIX FM listener’s party to some of Australia’s top artists. Cameron will be releasing his Brand New EP in May 2012, produced by Brad Bergan at Little Red Wagon Studio’s “Sydney”, Followed by an Album Launch Tour right across the country from Southern NSW to Northern QLD and maybe Victoria. Cameron Cusack’s biggest dreams and aspirations are to be a successful Country musician and songwriter. Musica da Camera, formed in 1979, is a Canberra-based string chamber orchestra of about 20 players. For over 30 years this group has been delighting Canberra audiences as well as music lovers throughout the region. The concert in Cooma will be directed by the Leonard Weiss. This entry was posted in Concerts & Events and tagged Classical Music Concert, Leonard Weiss, Musica Da Camera on May 4, 2013 by allan. Travel in syle to Chakola Hall on a Heritage Rail Motor. Train 1 departs Cooma Station at 6pm on Saturday 11th May where it will arrive at Chakola Station for the short walk to Chakola Hall. Lets Go Nuts Fudge n Food will supply us once again with a wonderful three course meal and Jazz Singer Amy Horneman and Jazz Pianist Mark Bolsius. This will be a wonderful and romantic environment for all the mothers in the world to have a carefree evening of fun, friends, food, music and adventure. Train 2 departs Cooma Station at 11am on Sunday 12th May where it will arrive at Chakola Station for the short walk to Chakola Hall. Lets Go Nuts Fudge n Food will supply us once again with a wonderful three course meal and Jazz Singer Amy Horneman and Jazz Pianist Mark Bolsius. This will be a wonderful and romantic environment for all the mothers in the world to have a carefree lunch of fun, friends, food, family, music and adventure. Both trains are same cost and tickets are available now at the Cooma Visitors Centre – Concession/Adults are $45 per person. 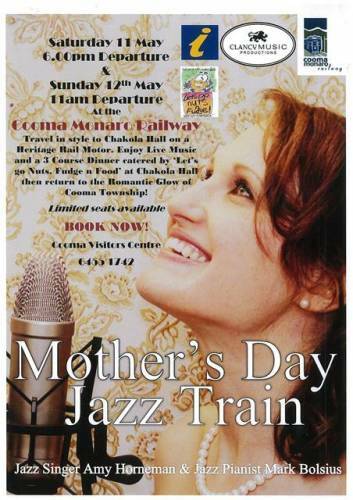 This entry was posted in Concerts & Events and tagged Amy Horneman, Cooma Monaro Railway, Mother's Day on May 1, 2013 by allan.